Deal of the Day! 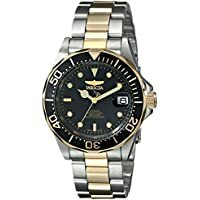 Today only, get Invicta 8927OB Pro Diver Automatic Two-Tone Steel Men's Watch from Amazon.com. Tip: Avoid low or no feedback sellers, search and select "Buy It Now" tab and sort by lowest price. You may modify min price to filter accessories to get Invicta Pro auctions.